Get ready for anything when you stay at the smoke-free Comfort Suites South hotel in Grand Rapids, MI near John Ball Zoo. We are located on Highway 131 near Gerald R. Ford Museum, DeVos Place Convention Center, Grand Valley State University, Gerald R. Ford International Airport and Frederick Meijer Garden. Business travelers enjoy access to copy and fax services and use our meeting space for events and functions. 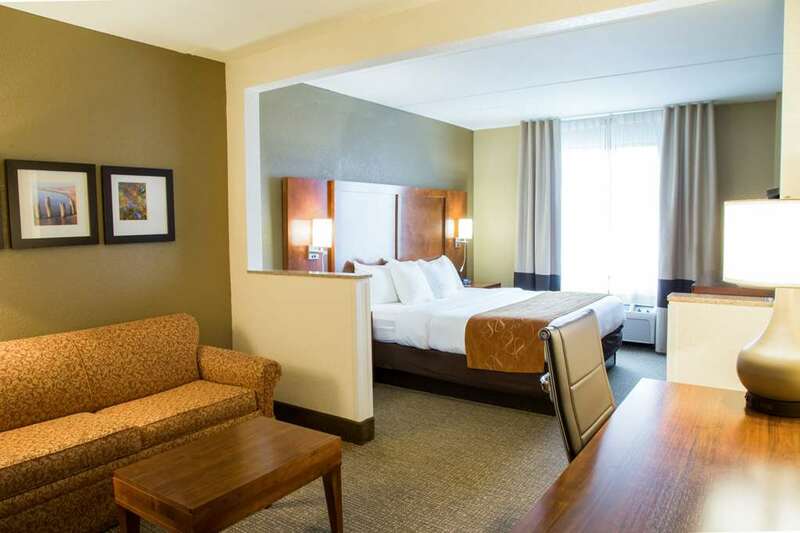 Additional hotel amenities include free breakfast, free WiFi, an indoor heated pool and a fitness center. Your inviting guest room includes refrigerators, microwaves, TVs, coffee makers and recharge devices. Also, earn rewards including free nights and gift cards with our Choice Privileges Rewards program. All Comfort Suites are smoke-free. Pet accommodation: 10.00 USD per stay. Pet Limit: 1 pet per room, maximum 40 pounds.